Just two polls were conducted in December, so we're still in a light polling phase. But the Liberals continued to lead by a very wide margin in the monthly averages. The Liberals led with 46.2%, down 5.8 points from November. The Conservatives were up 5.1 points to 29.6%, while the New Democrats were up just 0.2 points to 14.2%. The Greens followed with 5.4% and the Bloc Québécois with 3.7%. The shift between the Liberals and Conservatives is rather large by normal standards, but since we're only talking about four polls (two in November, two in December), it may look bigger than it actually is. November's tally, taken in the wake of the federal election, may also have been a little exaggerated. Regionally, the Liberals still led in British Columbia, though the margin between them and the Conservatives shrank. The NDP was also up. The Conservatives widened their edge over the Liberals in Alberta, while in the Prairies the Liberals dipped just below the Conservatives. The Liberals were down in Ontario to the benefit of the Conservatives, but the lead in the province remains very wide. The same goes in Quebec, but there was some movement that put the Bloc in third behind the NDP, reversing their relative standings from November. In Atlantic Canada, however, the NDP dropped from second to third behind the Conservatives. With these levels of support, the Liberals would win between 209 and 237 seats, expanding their majority government significantly. They would put up some very strong showings in British Columbia and Ontario, and virtually sweep both Quebec and Atlantic Canada. The Conservatives would win between 71 and 113 seats, with potential losses in British Columbia, Ontario, and Quebec. The New Democrats would win between seven and 17 seats, almost all of them in B.C. and Ontario. They would run the risk of being shutout of Quebec, as would the Bloc Québécois. The Greens would win just their one seat in British Columbia. So the Liberal honeymoon continues unabated. If there are any worrying signs in these numbers for any party (and no party should be worried this far out), it is that the New Democrats have not seen any rebound yet from a post-election frenzy for the Liberals, whereas the Conservatives are back to the numbers they have had in the polls for most of the last few years. 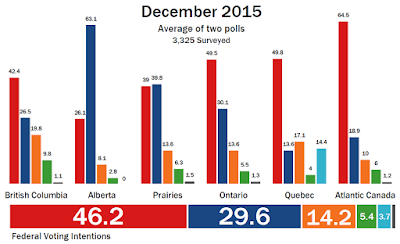 The only thing worse for Mulcair than these poll number is your seat projection Eric! 1 seat in Quebec! 7-17 in total!-These are Audrey McLaughlin numbers. April really isn't that far away so, Mulcair doen't have much time to turn things around. At 14.2% on top of a disastrous election campaign I would think it difficult to find a majority of Dippers who think he is doing a good job (of course Dippers aren't particularly well known for their political "smarts"). With these numbers I can't help but, think the NDP may have missed their opportunity for a merger with the Liberals. 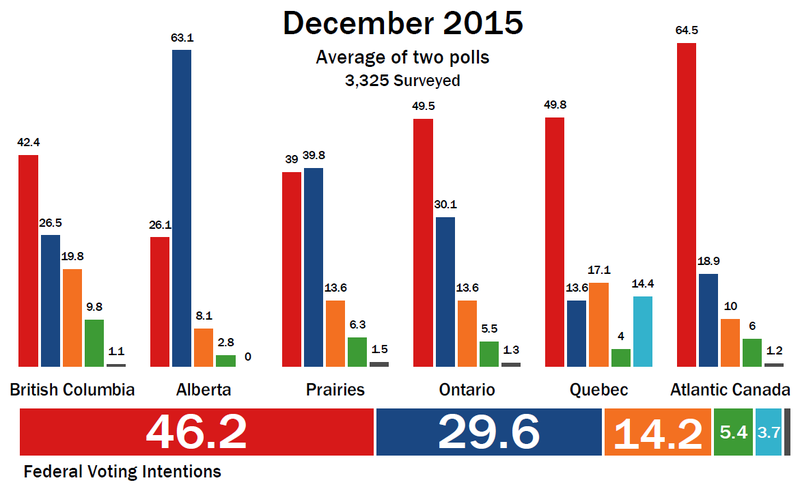 With two predicted general election losses this Spring, it will be tough times for the NDP in 2016. "unnamed sources" within the NDP say Mulcair should resign if he fails to receive 75%! I think Wpg that we all hope Mulcair goes. Who will replace him is a different story ? Are these predictions made with the three election swing model, and if so is this model using the 2015 election, or the three before it? This is the three-election model, including the 2015 vote. This is interesting. So while the Liberals managed to win the election by turning a bunch of non-voters into voters, they also managed to steal a ton of support from the NDP. The CPC numbers remain stable, as they have been for years.